West Coast of Northwestern American and Canadian tribes grilled their salmon on cedar planks and upright on wooden stands over open fires. over the top and sides. Place the brown sugar in a bowl and crumble between your fingers, add dillweed,  then sprinkle over the mustard. through, around 20 to 30 minutes. The internal temperature should read 135℉. Transfer the salmon and plank to a platter and serve right off the plank. 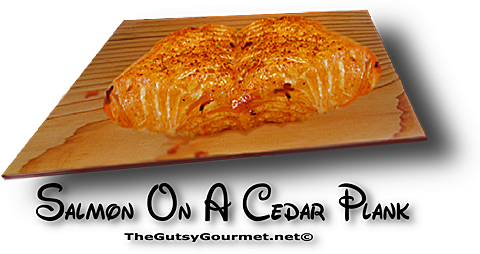 ✸  A direct method to grill the salmon may be used. Soak the cedar plank well. Spread the mustard and brown sugar on the salmon, but do not place the fish on the plank. Set up the grill for direct grilling on medium-high. When ready to cook, place the plank on the hot grate and leave it until there is a smell of smoke, about 3 to 4 minutes. Turn the plank over and place the fish on top. Cover the grill and cook until the fish is cooked through, reaching an internal temperature of 135 ℉  Check the plank occasionally. If the edges start to catch fire, mist with water, or move the plank to a cooler part of the grill.